Haji Ali Dargah is one of the most popular religious places in Mumbai, is a landmark monument, one of it's kind in the world. 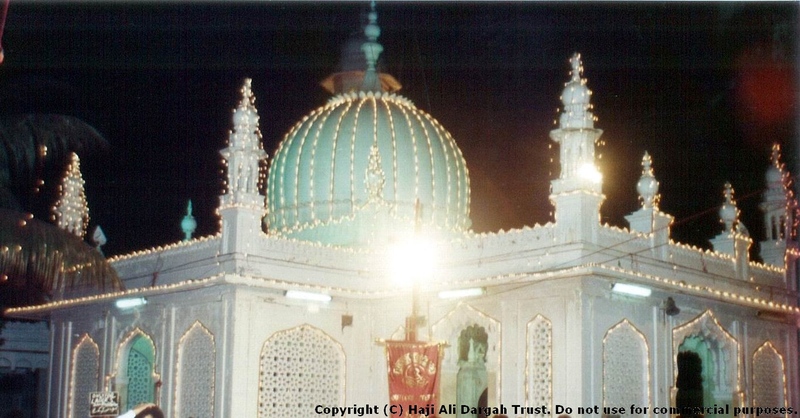 The Dargah Sharief is more than 500 years old. 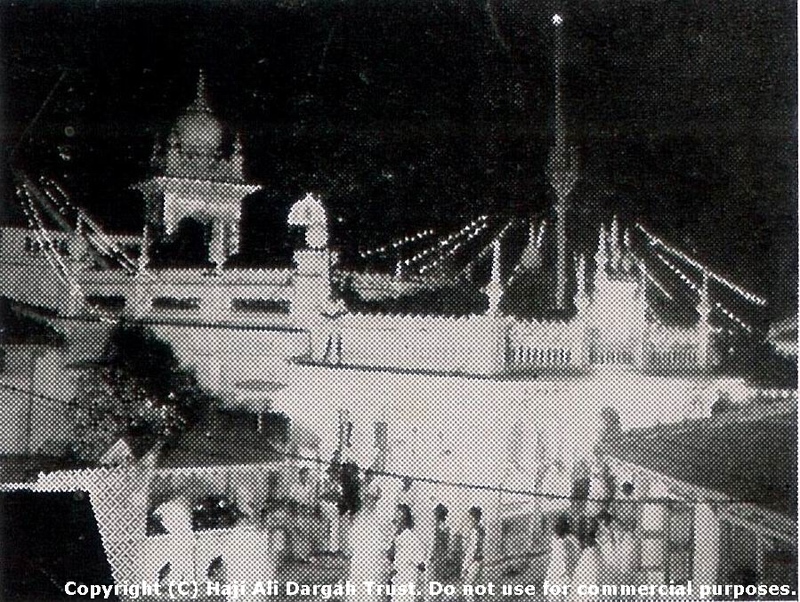 The pictures above show the Dargah Sharief as it existed before the present structure prior to 1960. 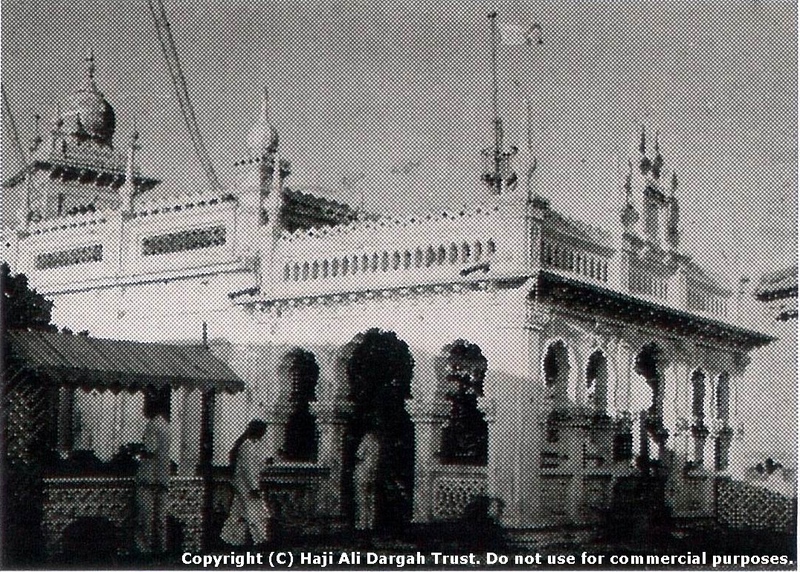 The present form structure of Haji Ali Dargah Sharief was reconstructed between 1960 and 1964 and the pathway leading to the Dargah Sharief was constructed between 1944 and 1952 by utilizing the funds of the Trust. 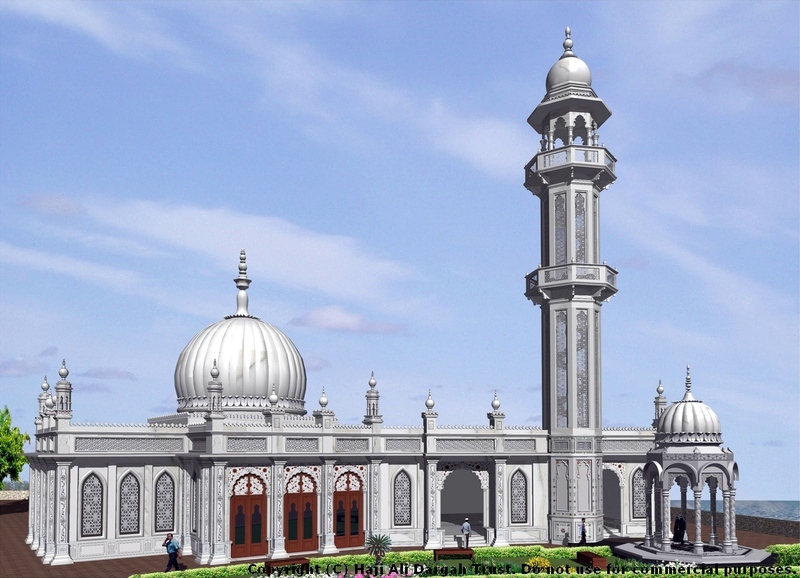 The structure has white domes and minarets reminiscent with the architecture of the Mughal period. 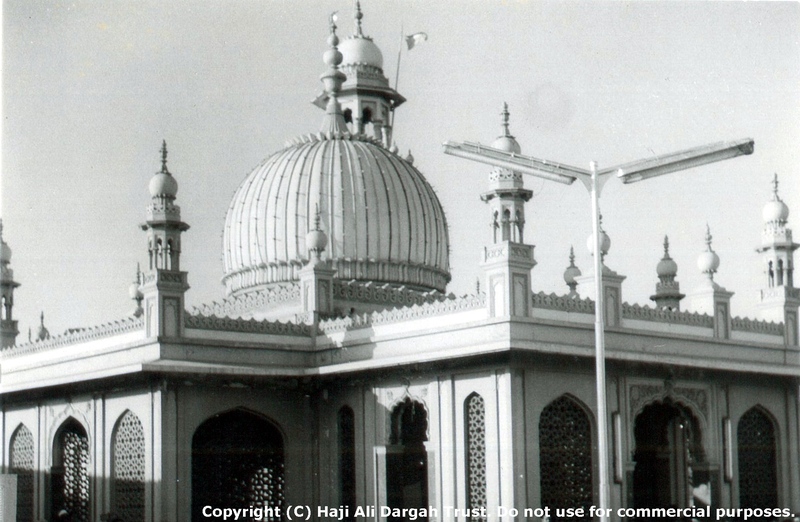 Below images show the Dargah Sharief in it's present state and form. The present and earlier structures are made of RCC (Reinforced Cement Concrete) reinforced with steel. The structure as observed by many a visitor has severely corroded due to it's proximity to the sea and salt-content in the breeze coming from over the sea. Even non-ferrous metals have been observed to corrode at Haji Ali Dargah. The structure needed repairs and restoration, however reusing RCC placed the same challenges in front of the Trustees who wanted to restore the beauty and ambience of the Dargah Sharief as well as ensure the longevity of the Dargah Sharief buildings. The Trustees in consultation with their structural engineers and architects decided to restore the entire mausoleum in solid pure white marble stone obtained straight from the famous mines of Makrana in Rajasthan (India) and create a semblance similar to the famous Taj Mahal. Being a heritage structure and in the middle of the sea, the Trust had to obtain various permissions from various departments of the government at all levels in the city, state and center took it's own process. Work was commenced in 2009 after obtaining all necessary permissions and clearances. Above are images of the sketch and layout plan of the proposed structure. 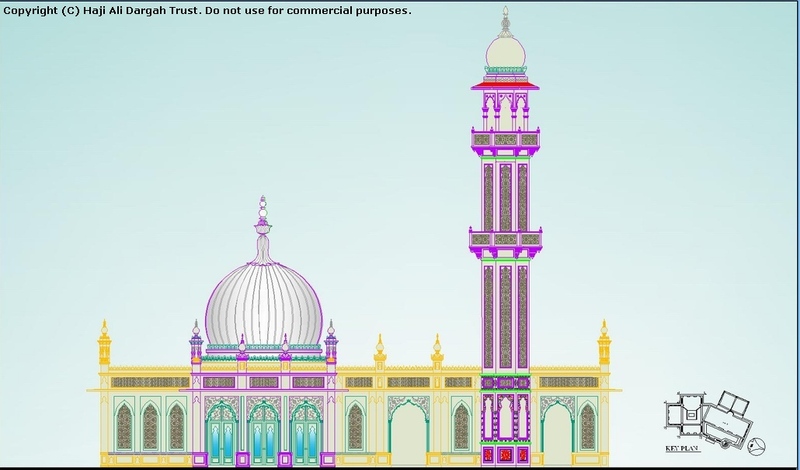 On the right are images of the sketch, Glasswork design of the proposed dome and the work-in progress on the Minaret of the Masjid. 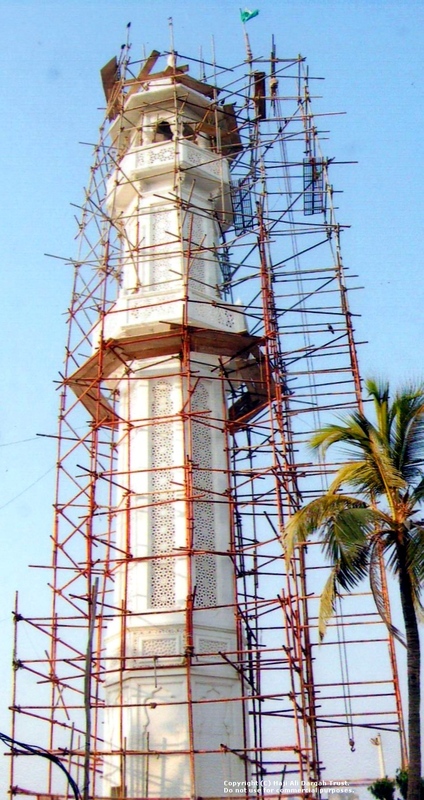 The work is being carried out in a phased manner in smaller proportions in order to accommodate the thousands of visitors and devotees who come to the shrine everyday and cause minimal disruption in their paying homage to the revered Saint of Mumbai Pir Haji Ali Shah Bukhari (R.A.). The trustees of Haji Ali Dargah Trust make a humble request and appeal to all visitors, devotees and followers of Pir Haji Ali Shah Bukhari (R.A.) to send in their donations, offerings and contribute towards the magnanimous and missionary task of the renovation, reconstruction and beautification work of the Dargah of your beloved Saint Pir Haji Ali Shah Bukhari (R.A.). And whenever you see it, visit it, or come to hear about it, you will feel that somewhere in the structure you have left an imprint of your heart and love for your beloved Saint Pir Haji Ali Shah Bukhari (R.A.) and in it will be your impression of the city of Mumbai where many a soul has found home and livelihood. To send your donations, offerings, please click here. You may also contribute in general and towards other specific activities carried out by the Trust. To know more about the Trust and it's activities please click here.